Not so long ago, we told you about the game’s demo and the absence of some features, and today we’d like to demonstrate you the new The Sims 4 gameplay video. The fresh trailer, which lasts 20 minutes, is accompanied with the comments of Ryan Vaughan and Graham Nardone - the producers of The Sims series. At the numerous requests of franchise’s fans, its creators have decided to make a surprise and show them The Sims 4 world, or to be more exact, its current version. So if you are really interested in how the game and its characters will look like and which exciting things await you here, then be sure that the new The Sims 4 gameplay video will answer all your questions and even more. 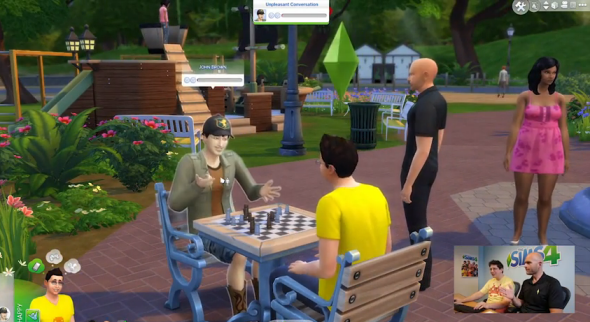 Thus, at the beginning of the trailer, it’s shown how both physical and behavioral traits will influence on the hero, his mental state and the relationships with other sims. But the most exciting thing, as it seems to us, is the characters’ facial expression. All their emotions and feelings are depicted on the sims’ faces, and it not only makes them more realistic, but gives you an opportunity to understand what your character feels right now and which actions you have to undertake in connection with this. Besides it, the fresh The Sims 4 gameplay video demonstrates us a few beautiful game’s locations, the moving between which, according to Vaughan, is much easier now. The new trailer also shows lots of other interesting things, but we think that it’s better to see them than to read about them, so we offer you to watch the trailer, published below. The Sims 4 game will hit the shops at the beginning of September on PC and Mac.